That wasn’t so hard, you just scraped a website using python. The question that you could be asking is how did that happen? You’ve looked through the heavily commented code that we used but still… Let’s go back, way back. We will now go though the steps that we needed to take before even writing our program in order to reach our goal that we defined in part 2 (find the gender distribution at the JMG institution). 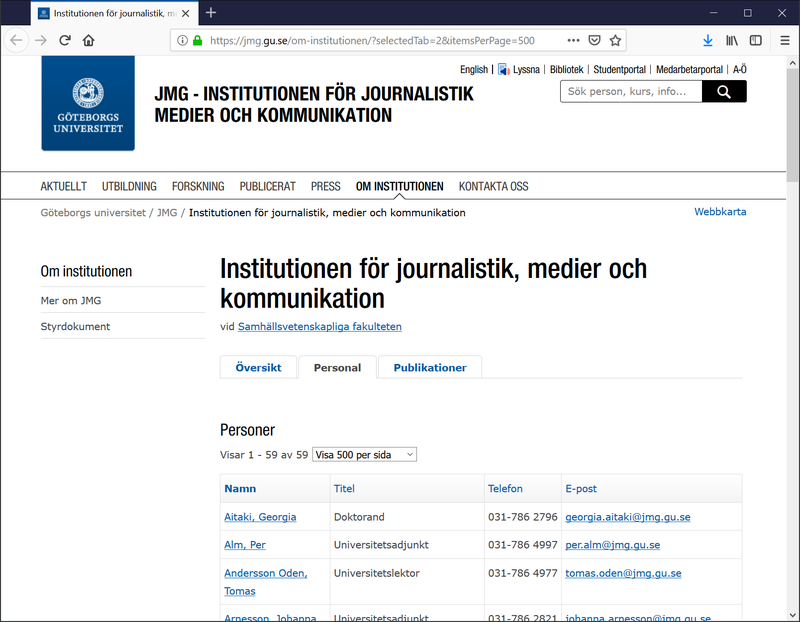 This is the first step towards our goal, we just go to https://jmg.gu.se/ Then navigate to the page “Om institutionen”, that looks interesting, then click “Personal”. Ok, there is some kind of list and the address (url) is https://jmg.gu.se/om-institutionen#tabContentAnchor2 . Right, so now we have an interesting list of staff there but there is also another interesting option to list 500 people/page, that is better because then we don’t need to scrape several pages to fetch all the names and titles that we are interested in. 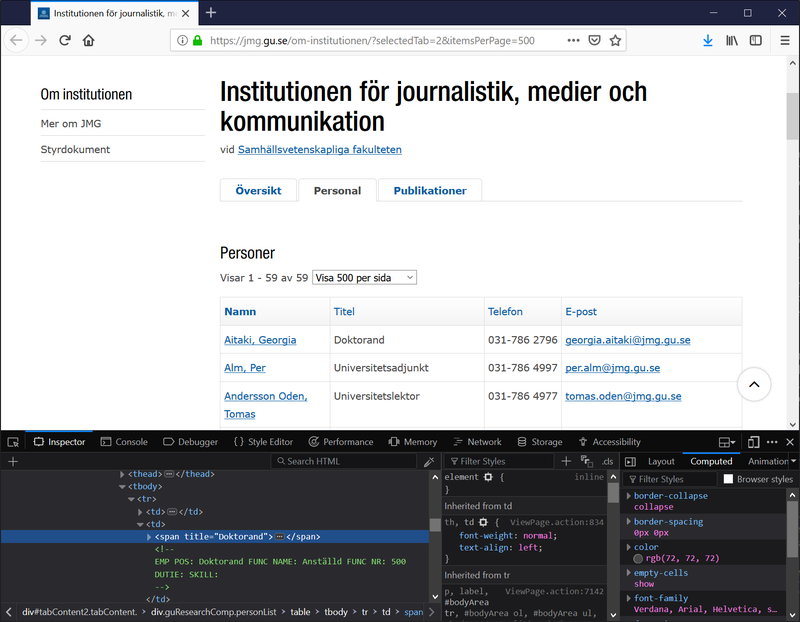 When you click Visa 500 per sida you can see that the url changed to https://jmg.gu.se/om-institutionen/?selectedTab=2&itemsPerPage=500 . Great, this page contains the data we need, now we just need to find it in the source code. There we see that the tag <span> with the property title holds the title. You could guess that this will be unique in the sense that if we search through the document in full for all <span> tags with the class title then we will only pick up the titles we are interested in, it seems likely. It looks like we are in luck, the persons name is right there in the <a> tag inside the <td> tag. I’m saying we are lucky, that is because this will be fairly easily reached, and normally it is not this easy. This is the part that fetches the webpage, the source code, the HTML, all the same. Mostly it should be self explanatory, just the thing that we need to specify the so called query parameters explicitly. These are normally encoded in the url as ?queryparam1=hello&queryparam2=world and so on at the end of the url. The object resp is now the response from that request. The response object resp contains some more data than the actual HTML that the request should have returned but to access the HTML we type resp.text. We create a BeautifulSoup instance with the arguments resp.text and 'html.parser' and store that in a variable called soup. Perhaps those technical terms in that sentence intimidated you, I will try to give a short explanation of those terms. Now a class is often written with capital letters, such as Gender or BeautifulSoup, that is just convention. Think of class as a model, a representation, a higher description of something. If you are familiar with philosophy it would be similar to the concept type in the context of type/tokens. There is this class and when you want to use it, normally you would instantiate it, from a class you get a class instance by putting parenthesis after the class name. In those parenthesis you can also pass values, these can be values that some classes use to make the instance in some particular manner, so that it will have some property. The values that we pass to the instantiation of the class BeautifulSoup are resp.text which is the HTML document and 'html.parser' which just tells Beautiful Soup to create a class instance that parses HTML. before our “persons list” all_persons is what you might guess a way to do this, for every loop it will assign the next person from all_persons to the variable person. That means that within the for loop, we have access to an object named person, this object somehow holds the data we want. The person object is just a wrapped <a> tag and to access a Beautiful Soup representation of an <a> tag’s content, we just type person.string. You can read the comments above it to understand exactly what it does but in short it extracts the first name from the full name given the syntax on the staff page. Now that looks like pure magic! You might guess that the variable gen now holds the gender information and you are right, you don’t need to know the details really. Just keep in mind that the program is not 100% accurate, there are unisex names for example. It should however be accurate enuogh for our purposes. 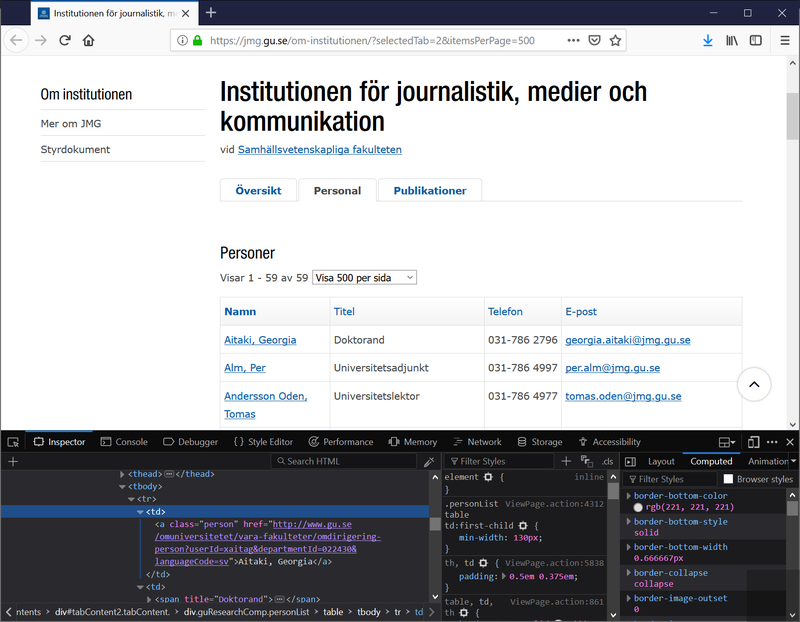 Ok, this is a little harder to explain but we basically navigate the HTML tree from the person <a> tag to the title, it’s pretty self explanatory really. What I am saying is that you should be able to read it, writing the code is somewhat more tedious work usually, you need to test, read documentation for beautifulsoup, test again and so on until progress. I’m going wild here to explain two rows of code in one go. The first line just sets up the object that carries the stats data, an object that we defined before the for loop, to which we add all the stats to on every loop iteration. The second row adds a 1 to the title/gender combination for the current person, so the stats collected is just a counting operation. When the for loop is done, just print the thing. As you can notice the line is not indented as much as the lines inside the for loop, it will be executed when the for loop is done and the list of persons is exhausted. As we already talked about, there are some improvements we can make. Parsing the title better, parsing the first name more accurately and also maybe the print out could be improved upon for a nicer presentation of the results. There are also some other things we can do now that we have the code to parse the JMG institution page, since it is part of GU, maybe we can use the same code for other institutions? Now go to the next exciting Part 4 of Scraping 101!! !